Does your home ever get that stale feeling? Does it smell like a cast iron skillet or a dusty antique store? Let’s be honest — odors happen! If the weather isn’t ideal for opening the windows, then you may be looking for some help to freshen the air in your home! So, where do most of us turn for help? Room sprays. In case you haven’t heard, the Environmental Working Group rates the average room freshener at a range of D to F for significant hazards to health and the environment (Amerelo & Geller, 2018). The good news is that you can make your own natural room spray to freshen up a space. However, room sprays are best used for a quick fix, such as a spritz or two to deodorize the kitchen or bathroom, and just like most quick fixes, the results aren’t long-lasting. Instead, you may be searching for a solution that cuts through nearly any and all odors with lasting results. One option is to make a simmering herbal potpourri to help banish odors throughout your home without causing health hazards. What Is A Simmering Herbal Potpourri? A simmering herbal potpourri is basically an herbal potpourri mix of dry ingredients that you boil in water. Unlike chemical fragrances that mimic the real deal, the aroma of an herbal potpourri will last throughout the day and even after you’ve stopped simmering. Is It Safe To Boil Potpourri? Boiling potpourri is safe, as long you as follow a few guidelines. First, choose a large pot to simmer your herbal potpourri in. Next, be careful not to overfill the pot with ingredients or water. Keep an eye or an ear on the herbal potpourri while it simmers, being sure to not let the water get too low. What Do You Need To Make A Simmering Herbal Potpourri? While having fresh herbs within reach to use in your recipes is ideal, I know from experience that not all herbs do well indoors during the winter months. Fortunately, dried herbs can be just as potent when it comes to aroma! Here’s list of aromatic herbs perfect for simmering herbal potpourri grouped by scent. This group of herbs is full of familiar scents. They are often grown for culinary purposes, and I’m sure you have enjoyed many of them in flavorful dishes. You’ll find minty, citrus, and even candy-like scents, all of which are wonderful in herbal potpourri. If you have a culinary garden, you’ve just found a new way to use the herbs growing in it! In this group, you’ll find herbs that remind us of a walk in the woods. Each will add a breath of fresh air and woodland scent to your simmering herbal potpourri recipes. These herbs are some of the most popular for soap making and perfumes, and I can see why — each have a unique, incredibly soothing floral scent. In the cooler months of the year, I crave spicy herbal aromas. Cinnamon, clove, nutmeg, and cardamom have my name written all over them! Who doesn’t want to add a little spice to their life? Try a spicy herb or two in your simmering herbal potpourri. When making a simmering herbal potpourri, keep in mind that ingredients and their amounts can vary. Each blend may be used as a new aroma to remove odors from the home or simply to enjoy on a rainy day. You’ll want to keep your dry ingredients at one to two cups total, allowing room in the stock pot for water and to reduce the risk of boiling over. Here’s an example of a simmering herbal potpourri recipe I love to make. Gather your ingredients, slice or peel fruits, and tear or rub the leaves of culinary herbs to release their fragrance. Place each item into a medium stock pot and pour in four cups of water. Bring the herbal potpourri to boil. Boil two to three minutes, then reduce to a low simmer. Simmer for up to four hours, while adding an additional half a cup of water every half hour as needed to avoid burning the ingredients. Creating a simmering herbal potpourri is not only purposeful, it is a beautiful experience. 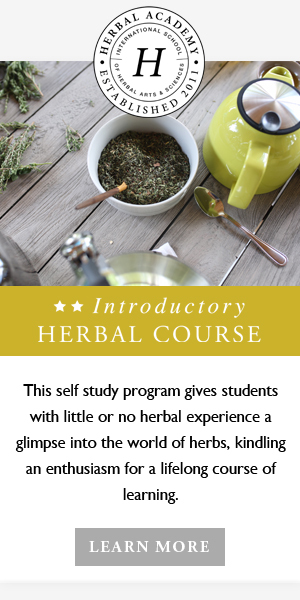 Foraging for woodland herbs, hand picking culinary herbs, slicing fresh fruits, and gathering whole spices is a rewarding adventure, and the result is an aromatic infusion of ingredients made just for you!